My young collegiate was anxious for an update to the room that had last been decorated when she was thirteen. A college co-ed desires a sophisticated space to return to when she’s home. Chic chinoiserie details pleased and surprised. 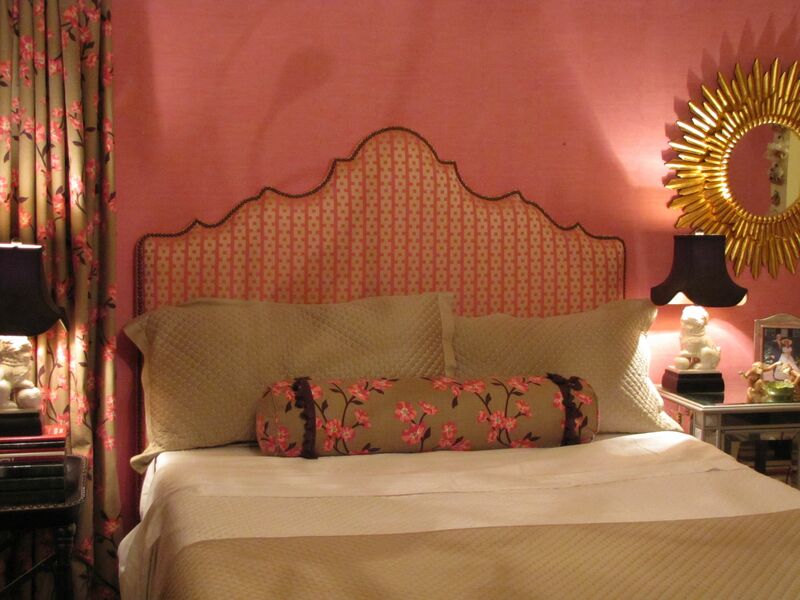 Pink dogwood linen fabric unifies the hot-pink wallpaper with the neutrals. And repeats the Chinoiserie theme. Existing strié wallpaper was kept. 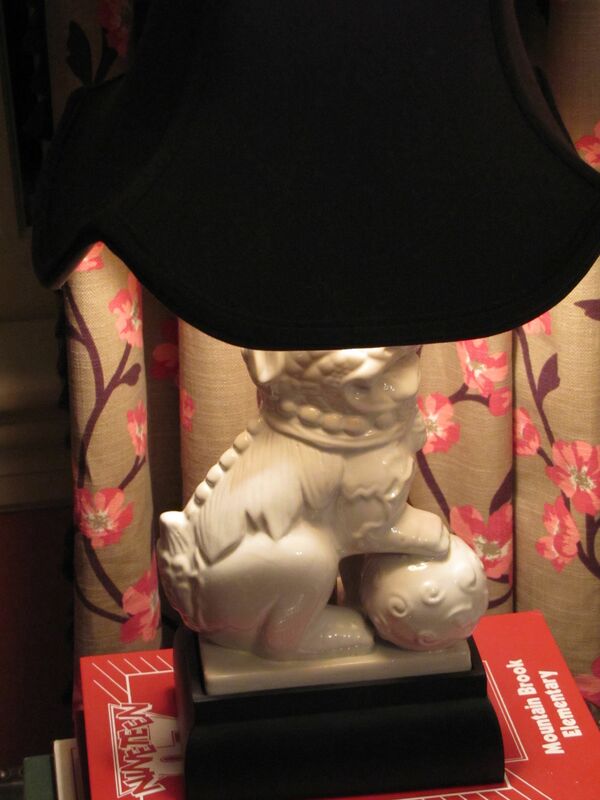 Foo dog lamps add a youthful vibe and continue the Chinoiserie theme. They also repeat the white in the dogwood fabric and bedding. Remember, white is never a neutral in décor, even though it always is in fashion. It must be repeated at least three times in a room. White peonies, a favorite, are a natural in this room. Fun and funky and ultra-feminine light fixture, below, with plenty of sparkle and a dark finish. 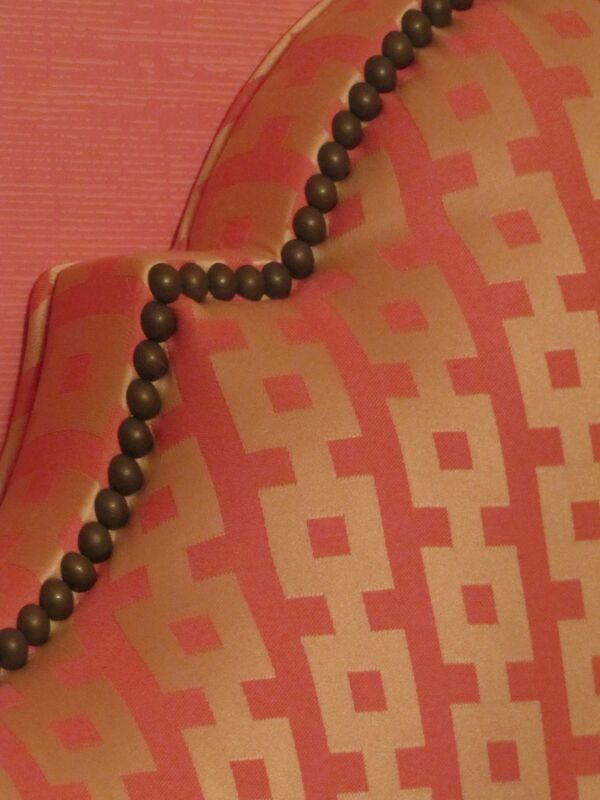 Repeating the shape, movement, darkness, of the branches on the drapery and neckroll fabric. Repeating the color of the lampshades as well. And, a gorgeous on-trend sunburst accent mirror, handmade and all-wood. Both sourced online for a song. If I told you from where, you wouldn’t believe it anyway. But, I know you, reader. I’ll show you the before. A little embarrassing so I’ll make this quick. 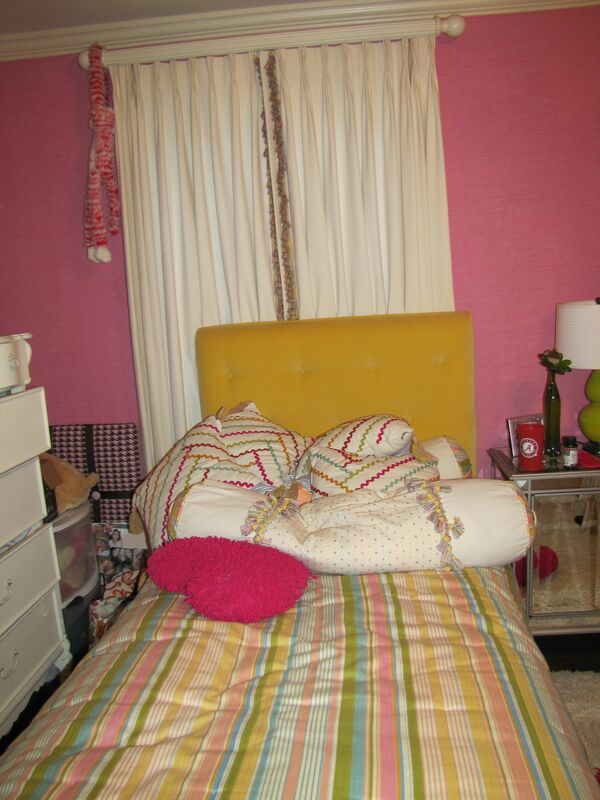 This entry was posted on December 3, 2012 by Ellen at Color Calling. It was filed under Chinoiserie, Decorating trends, lamps, Mirrors, Residential styling, using the color white and was tagged with Chinoiserie, padded headboard. Ellen, what a beautiful room!!! 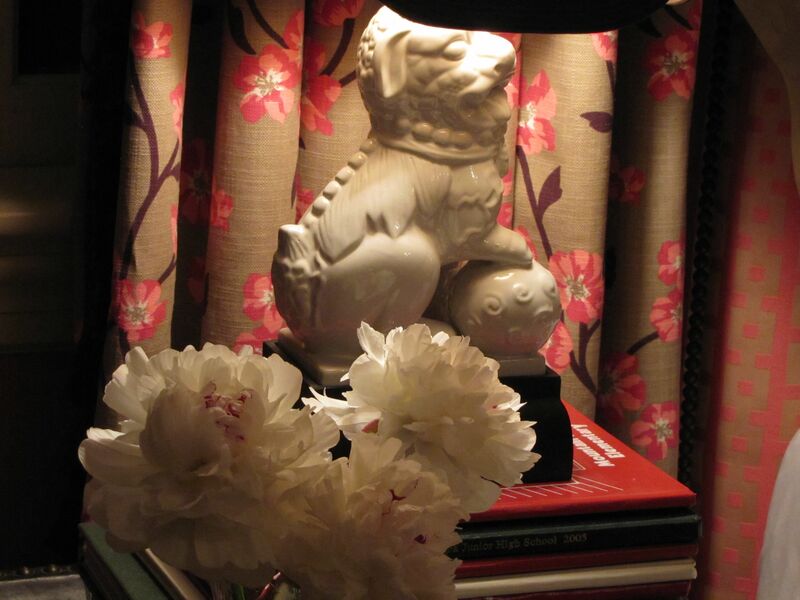 I would love to visit when she is away at college 🙂 Love those foo dog lamps. Thats fabulous Ellen!! 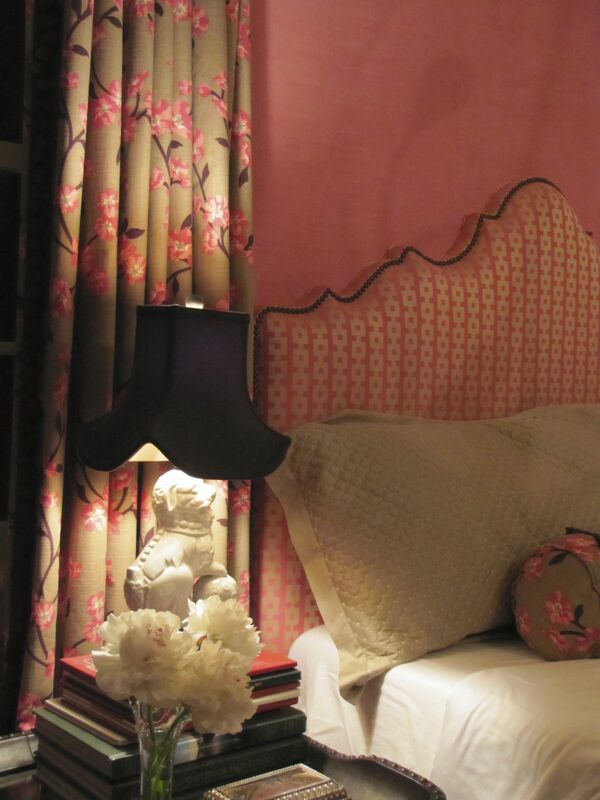 I am definitely a chinoiserie girl too!! Love it all! Wow what a transformation! I love it! What a great job, I love the existing wallpaper too then it gets even better from there! Love it.